Two men who raced each other up to 114mph along a windy road before one crashed, fatally killing an irreplaceable teenage boy, have been jailed. Fraser Hallam was on his way to play football when the Ford Focus RS he was a passenger in crashed on the A264 near Horsham in 2017. Just 19 years old, Fraser tragically died at the scene. Grieving mum Wendy said her son had been ‘beautiful inside and out’ and called for the drivers of the two cars to be given maximum prison sentences. Bryn Coughlan, 24, of Daux Avenue in Billingshurst, was driving the Focus on the tragic day. He pleaded guilty to causing Fraser’s death by dangerous driving. 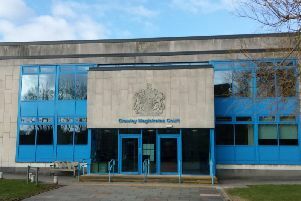 Christopher Keating, 29, of Eastcroft in Horsham, had been racing with Coughlan in another car, his trial heard. He was cleared of causing death by dangerous driving yesterday but found guilty of dangerous driving. Both men appeared at Hove Crown Court this morning for sentencing. In a statement read out in court, Fraser’s loving mum Wendy Hallam said IVF baby Fraser was ‘warm and kind’ and put everyone at their ease. She said: “He always put everyone else’s feelings ahead of his own. He was beautiful inside and out. “He made us proud of the person he became. Wendy told the court that Fraser had a ‘massive fear’ of speed, so losing him in this way has been ‘horrendous’. His sister Annabelle said she had reacted with ‘silent disbelief’ when she found out her little brother had died. She said: “Fraser no longer has the future he and his girlfriend dreamed of. It breaks my heart. Carwyn Cox, defence counsel for Coughlan, said: “This has had an immeasurable impact on their family. He told the court that Coughlan acknowledges that he was racing. He said his client had shown ‘extreme remorsefulness’ and knew what it was like to lose someone close to him. Sentencing the Coughlan, Judge Jeremy Gold QC said: “Fraser Hallam was just 19 years old when he was tragically killed as a direct result of your dangerous driving. “No sentence that I can impose can possibly begin to assuage their grief, a grief I suspect will never leave them. “I have no doubt that you were racing with the car driven by Christopher Keating. Coughlan was jailed for four years and disqualified from driving for six-and-a-half years. Turning to Keating, Judge Gold said: “You were convicted by the jury of dangerous driving. “They were clearly not satisfied that the prosecution had made out the necessary causal link between your driving and Fraser’s death. Keating was jailed for 3 months and disqualified from driving for two years and six weeks.